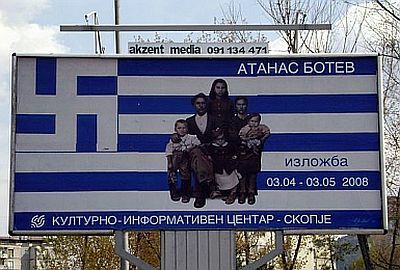 Posted by grhomeboy in Cyprus News, Cyprus Occupied, Politics. Turkey’s armed forces chief said yesterday that some 40,000 Turkish troops will remain on Cyprus despite a new peace deal between Greek- and Turkish-Cypriot leaders. “There is no such thing as pulling troops out tomorrow if there is a peace deal today,” said Yasar Buyukanit, wrapping up a four-day visit to the island’s Turkish-occupied north areas. “The army needs to observe and be fully convinced on how safe Turkish Cypriots are,” he said, according to Agence France-Presse. 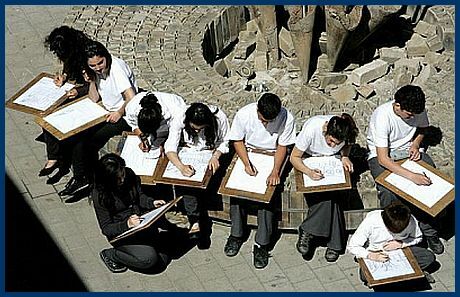 Children from a junior high school in Cyprus draw pictures of the buffer zone on Nicosia’s Ledra Street, in place since the Turkish invasion in 1974 but in the process of being dismantled, as UN peacekeepers sweep the area for land mines. Cyprus President Dimitris Christofias said yesterday that finding a settlement to reunify the divided island would be “a very difficult task.” But he said the working groups he agreed to set up following talks with Turkish-Cypriot leader Mehmet Ali Talat were a practical first step. “They have not been set up for show or for reasons of propaganda but to produce results,” Christofias said. President Christofias and Cyprus Foreign Minister Markos Kyprianou are to visit Washington for talks with US Secretary of State Condoleeza Rice at the end of next month. UN crews clear unexploded ordnance around Ledra Street before it opens > UN mine engineers sweeping the buffer zone for unexploded ordnance to allow crews to shore up crumbling buildings ahead of a crossing point opening at Ledra Street in Nicosia, yesterday. 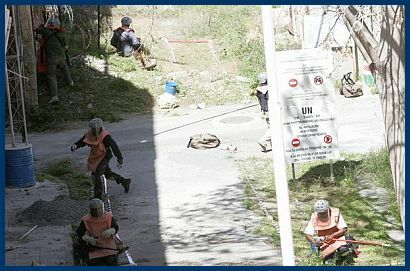 United Nations demining experts swept the buffer zone dividing Nicosia for discarded explosives yesterday as part of efforts to open a crossing in Europe’s last divided capital. UN spokesman Jose Diaz said demining teams completed a search for unexploded devices or booby traps that could have been left over from the 1974 Turkish invasion, which divided the island along ethnic lines. The sweep of the 70-meter (230-foot) stretch of no man’s land was necessary before work could begin to shore up dilapidated buildings on either side of the pedestrian thoroughfare. «A six-person mine action team carried out the search with support from UNFICYP (United Nations Force in Cyprus), during which no dangerous items were found,» a UN statement said. The clearance, shoring up and other preparations were expected to last 10 days or more, Diaz said. Barbed wire first divided Ledra Street, a busy shopping street in the Cypriot capital’s medieval core, in the early 1960s amid fighting between the island’s Turkish-Cypriot and Greek-Cypriot communities. The leaders of the Greek and Cypriot communities agreed Friday to open a crossing at Ledra Street as a sign of good will before resuming talks on reunifying the island. A sticking point appears to have been overcome after the Turkish army agreed to keep patrolling soldiers out of sight of the crossing point, officials close to the discussions said, speaking on condition of anonymity because of the sensitivity of the issue. The Greek Cypriot National Guard will also pull its soldiers back. The new Cyprus’ President of the internationally recognized Greek-Cypriot Republic of Cyprus, currently in the south of the island, Dimitris Christofias, and the leader of the breakaway Turkish-Cypriots currently in the Turkish occupied and military controlled north area of Cyprus, recognized only by Turkey, Mehmet Ali Talat, also agreed Friday to reach a reunification deal «as soon as possible.» Aides to Christofias and Talat agreed yesterday to quickly set up 13 groups of experts to bridge the gaps between the two sides on issues such as security, territory, crime and health. The groups will have until June to make as much progress as possible before Christofias and Talat begin face-to-face negotiations. However, Turkish troops will stay in the occupied northern areas of Cyprus until a «just and lasting peace» has been achieved on the divided island, Turkish-Cypriot leader Mehmet Ali Talat said yesterday. The Turkish forces in the breakaway north have been deployed «in line with international agreements,» Talat said. «They will continue to conduct their mission until a just and lasting peace has been achieved.» Talat was speaking at a meeting with visiting Turkish army chief, General Yasar Buyukanit, just days after he and newly elected Cyprus President Dimitris Christofias agreed to relaunch peace negotiations stalled since 2004. Talat said the influential Turkish military, often accused of advocating a hardline position on the Cyprus conflict, «supports us on the issues we are working on, together with the Turkish government.» Buyukanit said: «The Turkish soldiers are here for the security of the Turkish Cypriots. They have ensured their security and will continue to do so.» Turkey, the only country to recognize the government in the occupied north, maintains more than 40,000 troops there. Cyprus President Dimitris Christofias said yesterday that he would push to reopen a landmark street in the divided capital of Nicosia after Turkish troops prevented United Nations officials from getting started on clearing up the area. Turkish troops stopped a UN initiative to clear explosives and other materials from Ledra Street, which runs through the buffer zone that divides northern and southern Nicosia, citing “technical problems.” Meanwhile, sources said that Turkey’s armed forces chief Yasar Buyukanit is due in the Turkish-occupied north of Cyprus today. It was unclear whether the trip had been planned. Cyprus President Christofias and Turkish-Cypriot leader Mehmet Ali Talat last week agreed to open up Ledra Street as a symbolic move ahead of renewed peace talks. 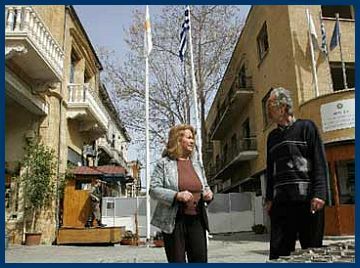 The Cyprus President yesterday said he believed “barriers would be overcome.” Nicosia, the capital city of the Republic of Cyprus, is the last divided city in Europe. 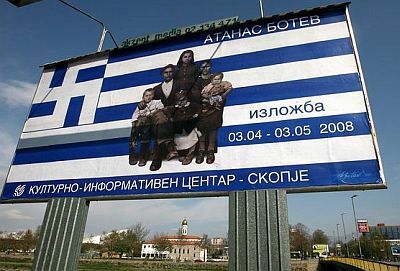 Greece and the Former Yugoslav Republic of Macedonia (FYROM) were last night involved in yet another effort to solve their name dispute but only after the neighboring country’s Prime Minister had accused Athens of trying to “blackmail” Skopje over the issue. The comment by Nikola Gruevski came only hours before representatives from both sides were due to meet with the United Nations mediator Matthew Nimetz in New York for further discussions aimed at finding some compromise. Nimetz was not due to make any public comments about the meetings until about midnight, Greek time, last night. However, the statement by Gruevski earlier in the day appeared to heighten tension between the two sides ahead of yesterday’s talks. Bakoyannis indicated that time was running out for finding a solution to the dispute before the NATO summit but that a “consensual, practical and enforceable” compromise could be reached.